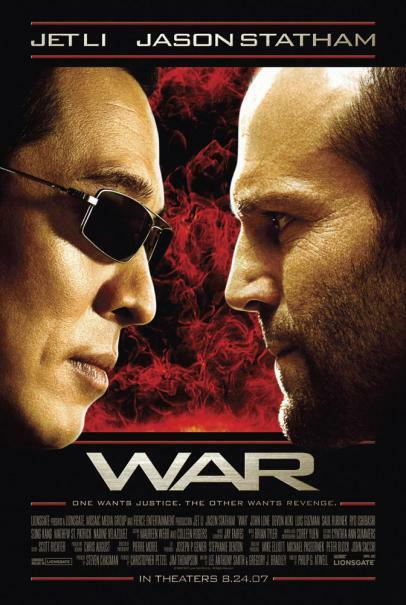 A full-throttle, martial arts thriller, Lionsgate's "War" stars Jet Li ("Fearless," "Unleashed," "The One") and Jason Statham ("Crank," "The Italian Job") as two adversaries set on a violent collision course in the Asian mob underground. Produced by Steven Chasman, Jim Thompson and Christopher Petzel, "War" is directed by Philip G. Atwell from a script by Lee Anthony Smith and Gregory J. Bradley. After his partner is brutally murdered by the infamous assassin Rogue (Jet Li), FBI agent Jack Crawford (Jason Statham) vows to find the elusive killer and personally avenge his partner's death. But Rogue proves untraceable until three years later when he resurfaces to ignite a bloody turf war between Chinese mob leader Chang (John Lone) and Japanese Yakuza boss Shiro (Ryo Ishibashi). Eager to capture Rogue once and for all, Crawford leads his team of crime specialists headlong into the conflict. But Crawford's thirst for vengeance jeopardizes his professional judgment, and as the violence escalates, Crawford finally comes face to face with his enemy to discover that nothing about Rogue or his plan is quite what it seems.